Everybody remembers the name of Mastani as soon as Bajirao Peshwa's name comes. They loved Mastani very much Therefore, next to Shaniwar Wade, Bajirao did the Mastani. S 1734 was built in the palace, named after Mastani Mahal - Mastani Mahal. I. S In 1728, Mughal Subedar Muhammad Khan Bangshal attacked Bundelkhand, seeing the power of Bengal, Maharaja Chhatrasal sent a secret message after receiving the message received from Bajirao, Bajirao along with his Maratha troops reached Bundelkhand, together with the army of Chhatrasal, Muhammad Khan Bangash The army responded by breaking the silence and Chhatrasal won. Maharaja Chhatrasal gifted one part of his kingdom to Bajirao as part of the three pieces, including Jhansi, Sagar and Kalpi. Along with giving the kingdom, Maharaja gave his daughter Mastani's hand to Bajirao as well. But according to historians, Mastani was the dancer of the court of Chhatrasal. After falling in love of Bajirao, Mastani, they got married to Mastani. Because of Bajirao's high status Brahmin, the entire Brahmin community and Hindus opposed him. Along with that Mastani was never accepted by Bajirao's first wife Kashi Bai and other members of his family. But Bajirao was not one of the retreaters. In view of the inability of keeping Mastani in his own palace and seeing the opposition of the family, Bajirao had built a magnificent mirror palace for the masts in front of Shaniwarwada. There were thousands of eyewitnesses in this palace. Which is known as Mastani Mahal. Next to the palace was built a special kund for the bath of Mastani on the Dive Ghat. And in this palace, all facilities were provided for Mastani. It is said that this palace was the most beautiful and luxurious palace of that time. 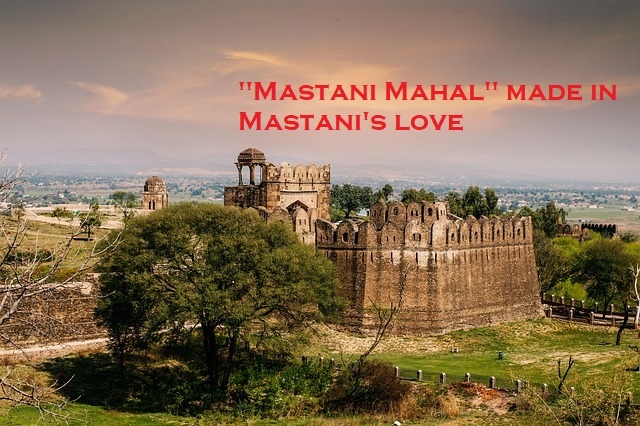 Mastani Mahal was seen as a sign of love of Bajirao Mastani. Despite being a Muslim from Mastani religion, Krishna was to follow. He had complete devotion to Shrikusha. That is why Bajirao and his son named Krishan Singh, which we know as Shamsher Bahadur, which was nurtured by Bajirao's first wife Kasibai and who later joined the warrior form in Panipat's war. This door opens south direction. When Bajirao's wife Mastani went out of the fort, he used this door. Therefore its name is Mastani door. This magnificent palace of Mastani was burnt to ashes in a fierce fire; Some historians also call it a conspiracy. Even today the remains of the Mastani palace are present in the King Kelkar Museum of Pune city.